Chainsaw is an important power saw for woodworking works. In this post, we have covered chainsaw reviews of Husqvarna, Poulan Pro, Blue Max brands. If you want to check other brands, then check below this post. The Husqvarna line of products is known for being some of the best on the market, especially the Husqvarna 240E chainsaw. This chainsaw is the perfect fit for projects around the home as well as for the professional tree trimmer. These products are designed to last and provide the user with quality and dependability for years. Husqvarna has been a name that represents quality for years, regardless of the product. The Husqvarna 240E is a lightweight, gas-powered chain saw that is the perfect choice for projects around the home such as cleaning tree debris out of the yard and preparing logs for use in the fireplace. For the person that works in the tree trimming business, this handy little chainsaw will cut through even the thickest branches with ease. Do not forget to read Husqvarna 435 vs 440 vs 445 vs 450 vs 240 vs 450 e vs 455 comparison. This chainsaw weighs only 11.6 pounds, which means the user will not become fatigued due to the weight of the saw. In keeping with the fatigue factor, the 240E has what is called LowVIb vibration damping. The saw has an ergonomic design that includes a handle with a seven-degree offset. What does all of this mean? It means less fatigue for the user, even after using the chainsaw for a long time. Additionally, the Low-Vib will make the vibrations less, which means using this chainsaw is easier on the joints in your arms, shoulders, and hands. Emissions are a huge factor in every gas-powered engine today. The people at Husqvarna know this and have modified the engine on the 240E with the X-Torq technology, which not only cuts the levels of emissions by as much as 60 percent, it increases fuel efficiency. This technology has been proven to cut fuel consumption by as much as one-third. Both of these factors are especially important for consumers today. The rising prices of fuel are always of concern while the levels of emissions are of huge concern in certain heavily populated areas of the US. In the past, one of the biggest problems with chainsaws was getting them to start for the first time each day. This was especially troublesome in the colder weather. With the Husqvarna 240E, that’s no longer a concern. This chainsaw has a combination choke/stop control knob that allows the operator to start up the chainsaw effortlessly. As the engine starts so readily, the risk of engine flooding is also decreased. This will save time that is otherwise spent waiting for the engine to breathe. Another common problem with chainsaws in the past was the air filter would frequently become clogged from the debris as the chain spinning. Husqvarna realized this and has taken every measure to alleviate this issue. The Husqvarna 240E has a centrifugal air cleansing process that works to get rid of the bigger debris that is the most harmful to the air filter and engine. The crankshaft in the engine is comprised of three separate pieces which are forged and then compressed to provide the owner/operator with a long-lasting, superior engine. We have also covered other model of Husqvarna chainsaw review 240E below. Although the 240E has a great engine and emissions system, some users have found different problems with the saw itself. For example, user L.B. claims the 240E has a “bogus chain tightening system that is more awkward than the old way using two nuts. Other real users of this saw have complained about the chain tightening mechanism as well. Negative user reviews focus mainly on the problems listed above. Many users claim the chainsaw is better for only light, infrequent use rather than for medium-duty use as Husqvarna claims. Although there are downsides to this chainsaw, there are many benefits to it as well. The 240E has a compact, lightweight design that is handsome and durable. The saw itself is very easy to start and operate, which makes it appropriate for use around the home as well as up in a tree. It has been a household name that represents excellence for many years. The Husqvarna 240E is one chainsaw that every homeowner should have. Read reviews of Husqvarna 435, 450, 455 and 460. The Poulan P3416: one power-packed son of a gun. There are many things to look for when trying to decide between chainsaws. Reliability is a big factor. How many times have you been in the middle of a job only to be stranded mid-cut because the belt came off, the engine blew, or the chain slipped? It’s disgusting. No worries of that type with the new Poulan P3416. The P3416 is definitely reliable. Many people have reported that they didn’t winterize them, left them sitting for long periods of time, and when it came time to use them, they fired right up. No stalling, no having to drain the fuel and clean the thing. Reliability has made this little saw popular with both the homeowner and the professional. More professionals are turning to the Poulan pro P3416 because it seems this saw loves to cut branches and clean up debris from storms. Some of the most used saws were the P3416 during all of the damage and storms that have hit the US just during the past few years. And, the P3416 was there to help make things right again. Chainsaws can be pricey, so reliability coupled with affordability make the Poulan P3416 a good all-round candidate. When bought properly and with great thought, a chainsaw can last for a long time. These tools are not like the average homeowner’s tool collection. 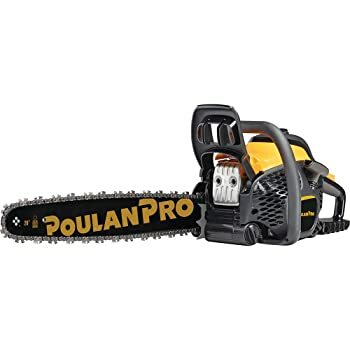 Check Best deals on poulan pro chainsaw at Amazon. One of the main features of the Poulan P3416 is that the chain brake is inertia activated so that the user doesn’t have to worry about the chain seizing up in the middle of a job. This is also an additional safety feature, protecting the user from accidental pulls or tears from the material being sawed. Other features that make this saw virtually indestructible are that it has an auto oiling system. Other chainsaws claim to have this feature, but then you have to push a button to release the oil. Not so with the P3416. One nice thing about the P3416 is that the manufacturers understand that one grasp size does not fit all. Read Poulan P3314 Review. The handle is wide enough that someone with large hands doesn’t have to reposition for the tough cuts, and it is also usable for those users with smaller hands. Additional features to the grip include padding, grip covers, and a rubber rip that protect your hands while you work. Some users complain about vibrations that may not be suitable for women or young adults. And some others complain that it doesn’t feel substantial enough weighing in at approximately 15-16 pounds. Many machines, if they have to sit idle too long, tend to develop clogging issues. Not so with the Poulan P3416. This machine holds its strength and durability whether it’s used every day on the professional’s job, or kept on the shelf most of the time in the homeowner’s garage. It also does not kick back the dust when it is cutting anything, such as log, or tough branch. This makes it easier for the user to see what he/she is cutting, adding to the safety of the chainsaw. The bare basics about this machine that you need to know are that it usually comes with a one year warranty. This sixteen-inch chainsaw, ideal for simple jobs, has a very clean air filtration system, comes fully assembled, auto oils itself, and has the basic dimensions of 32 by 11.6 by 12 inches. Most models hold about 34cc’s of gas, weighs 16 pounds, and can tear through thickest brush out there. Are you happy with this poulan chainsaw review? If not check customer opinion of other brands. The best way to judge for yourself, of course, is to try one. There are numerous videos on the net showing the power of the machine, but until the weight and balance of the chainsaw are felt, one cannot fully understand why Poulan owners become so proud, even protective, of their chainsaws. This is because most who own a Poulan won’t part with them, and most have had one for many years…making them part of their go-to equipment to have on hand. Based on real reviews by customers who own one of the Poulan P3416 they are extremely satisfied with its performance, its reliability, its comfort, and its pricing. It comes fully assembled and ready to take on any job, big or small, that you may ask of it. Get ready for those upcoming cold winter months with the Poulan Pro PP4218AVX 18 inch chainsaw. If you are in the market for a brand new saw with plenty of power behind it, then you should check out some of the reviews on this fantastic Poulan Pro product. Featuring a handy 18-inch guide bar and an anti-vibration handle that ensures both comfort and safety, this is one great piece of equipment from a well-known brand that you can trust. Poulan Pro chainsaws have always been known for providing their customers with the best features for outdoor equipment. Their units come fully assembled and include a one-year warranty should any problems arise. Read on to find out more about this product and get informed with some helpful customer reviews. With the Poulan Pro PP4218AVX 18-inch 42 cc 2-cycle gas anti-vibration chainsaw, you can get ready to tackle all of your outdoor tasks. One of the positive features of this particular unit is that it has an anti-vibration system that allows you to keep working all day in comfort. This unique system is able to isolate the saw’s engine from the chassis, therefore, reducing the amount of vibration to the handle and the entire machine itself, making it safer to use. Another great safety measure on this Poulan Pro saw is the inertia-activated chain brake. If a kickback should happen to occur, this feature will automatically stop the rotation of the chain. Some other exceptional features on the Poulan Pro PP4218AVX include a reverse sprocket for less complicated chain replacement as well as tool-less chain adjustment. An improved pulley starting system with a padded grip on the starter rope, an excellent clean air filtration system and a soft, comfortable handle that is easy to grip and hold on to. One of the highly convenient aspects of this product is the auto oiling system, which keeps both the bar and the chain lubricated continuously during use. The Poulan Pro comes with its own carrying case so that you can keep the unit neat and clean while transporting it. The heavier construction and smooth running allow you to use the machine’s own weight to help cut through the thickest pieces of wood. These units come with an extra replacement chain, which is at least a $20 value and they also include a container of 2-cycle engine oil to get you started. This chainsaw is a great product that can take on any job you have in mind, however, there are a few downsides to this machine that some customers have had problems with. While the PP4218AVX offers you an exceptional price based on other industry-leading brands, some customers say that by buying the cheaper product, you get what you paid for. One customer review states that they purchased this unit because of the cheaper price as compared to other high-quality chainsaws in the industry, and they are now unhappy with their choice. He said that it was hard to start and that once they finally got the machine started, it stalled constantly and could not be started once again until the unit had cooled down. When he took it in for repairs, his mechanic told him that he couldn’t do much with it because the carb had very limited adjustability. The only way to fix the chainsaw completely would be to install a brand new carburetor. Due to cost, the mechanic did not recommend to go that route and the customer was left with owning a faulty product. While that’s an obvious reason why you should not buy the PP4218AVX chainsaw, this product has many more positive reviews than negative. One person states that this chainsaw is a perfect saw for the price. They mention that their saw started in just three pulls and that they really liked the comfort grip pull handle as well as the fact that it didn’t leak oil everywhere as their former chainsaw had. They said that it has a much smoother and faster-cutting speed and it idled very well without dying on them. They especially liked that the product came with a free extra chain, which would save them money in the long run. By reading customer reviews, you can see that this product has more positive benefits than negative and Poulan Pro PP4218AVX is a high-quality brand that many serious workers choose for all their outdoor wood cutting projects. Give the handyman or lumberjack on your Christmas shopping list a Blue Max 38538 18-inch 45 cubic centimeters 2-cycle gas-powered chain saw this holiday season. It’ll be appreciated when it comes time to cut that firewood and later in the spring when it’s time to trim those branches. Pruning, limb removal, and general tree maintenance will be a breeze with this tool. Preparing cords of firewood will be no trouble at all. This is the one power saw that does it all. Check best deals about blue max chainsaw at Amazon. The Blue Max 38538 gas-powered chain saw has features that will be well appreciated. Being gas-powered means there’s no electrical cord to tie you down; this is essential if one has to roam far from a source of current. The chain saw has a 45 cubic centimeter high-performance engine. This gas-powered chain saw has an automatic bar chain oil feed system, which lubricates the saw as it’s used. This helps ensure that the chain saw will last for a long time. It has a manual pressure relief valve. The 18-inch bar means the saw has a cutting capacity of up to 36 inches in diameter. The chain saw requires no assembly; simply fill with fuel and use. It has many of the same features of other gas-powered chain saws costing much more. In addition, this chain saw is approved by the Environmental Protection Agency. The dimensions of the chain saw are 11.7 inches in height, 11.7 inches in width and 19 inches in depth. For safety, the Blue Max 38538 gas-powered chain saw has an inertia-activated chain brake that stops the blade from rotating, in case of kickback. Another safety feature is the chain saw’s chain and bar design, which helps reduce kickback in the first place. Kickback is the uncontrollable circular motion of the chain saw towards the person running the chain saw. Kickback can happen if the blade jams while cutting. Besides safety feature built into the Blue Max 38538 chain saw, other ways to reduce the possibility of kickback are to maintain the sharpness of the cutting edge and to hold the saw properly with both hands, having firm footing. Blue Max 38538 has a couple of drawbacks. First might be its weight. At nearly 18 pounds, it’s something to consider if you have to carry it for some distance. Another drawback is that if you live in the state of California, you can’t buy this chain saw because it’s not California Air Resource Board or CARB compliant. I hope this review of blue max chainsaw helped you. You have to buy a CARB-compliant chain saw. Like all chain saws, it’ll need routine maintenance to perform its best. The chain will need to be kept sharp, and sawdust must be removed so it won’t clog the air intake. You’ll know when the chain becomes dull by the type of leavings you see: a sharp blade results in long clean-cut shavings, whereas a dull chain gives you powdery sawdust. After reviewing the features of this gas-powered chain saw, you can see that it gives you a lot for the price, yet you’ll find that it’s modestly priced. Most retailers offer it for under $. That’s a bargain price compared to similar gas-powered chain saws on the market. Don’t wait for stores to run out; buy the Blue Max 38538 today. For anyone that needs a solid electric chain saw in order to take out trees and other debris, the Makita 5012B may be just when you are looking for. The electric chain saw has a variety of features, allowing for improving performance over other brands. Of course, when using the Makita 5012B chain saw, you need to make sure and wear protective clothing, including gloves and eye wear, as you don’t want any items striking your face and causing an injury. Once you are properly dressed, you are ready to begin using the Makita 5012B electric chain saw in order to remove the clutter and cut the material down into smaller pieces. Do you like this review of makita chainsaw? Check Hitachi chainsaw reviews by the real customer with pros and cons. The Makita 5012B commercial grade electric chain saw has a 12-inch stretch and 11.5 amp power. It is extremely lightweight at only nine and a half pounds, allowing you to move the equipment around easily, without your arms becoming tired. It has a 5500 feet per minute chain speed, allowing for an impressively high-speed cut. The built in handling deflector bounds off debris to help protect the user, so although gloves are recommended, they are not necessary with the protector in place. The equipment is electrically based, so it must be connected to a lower power outlet. The Makita 5012B does not produce any smog or other air impurities, thanks to its electrical power connection, so you can rest easy knowing you are assisting in reducing the amount of smog produced. Of course, you do need an extension cable in order to use the equipment, as you are most likely going to be far away from a nearby power outlet. On top of this, the Makita electric chain saw has a nice price tag, making it significantly less expensive than many other models, without a loss of power or performance. ==> CLICK HERE for Best Deals on Makita chainsaw. There are a few downsides to the Makita 5012B, although they are rather minimal. The one main problem with the equipment is its lack of a battery. The electric chain saw does use a considerable amount of power in order to cut through most material, so a battery capable of powering up the equipment is not likely, but you still are tethered to a power outlet. Having a long extension cord is one thing, but it still makes it difficult to move into the back woods and trim up trees and other material. On top of this, it is possible to accidentally cut the extension cord when moving the saw, which requires you to replace the cord, before you are able to begin using the saw again. Outside of this, there aren’t many other problems with the saw, with all the reviews raining praise onto the small but powerful device. If you are looking for an extremely handy electric chain saw that has few to no flaws of any kind, the Makita commercial grade electric chainsaw may be perfect for your needs. 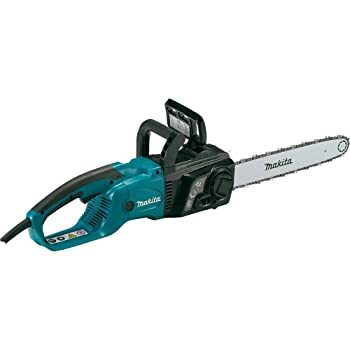 This is not a heavy duty saw, and most heavy duty chain saws should be left to professionals, but for moderate yard work and removing branches from trees, this Makita saw is a must have. Just make sure to have proper hand and eye protection before firing up the electric device, as you want to protect yourself from any possible damage. There is little required maintenance outside of the occasional lubrication of the chain and replacement of damaged chains. If you want the very best mid-range electric chain saw, all while being environmentally friendly, the Makita 5012B commercial grade 12-inch saw may just be what your looking for, and is sure to help out with any project you have around the house. We hope this post of chainsaw reviews helped you. Check What other customers at Amazon are saying about makita chainsaw. 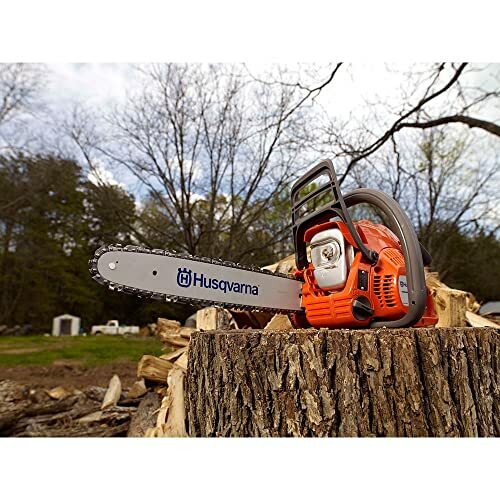 Check customer opinion about Husqvarna chainsaw at Amazon. Check Amazon customers opinion about Poulan pro. Read Amazon customers opinion about Blue max chainsaw. After reading reviews of Makita, Husqvarna, Poulan Pro and Blue max, take proper decision in buying a good chainsaw.